Since the the cold and breezy Michigan Fall of 1991, when I sat in front of a Sun powered Unix workstation running some version of SunOS, I have been awed and hooked onto the Unix/Linux movement. When PCs were still dark, textual with a green display; while Macs were still black and white, I was using this awesome machine with a humongous 20 inch monitor and a full color display. And yes, it ran something called OpenWindows which was way ahead of what others had to offer at that time. Since that time I have used almost all versions of Unix (NeXTStep, Solaris, IRIX, AIX etc) and later Linux (Red Hat, Fedora, CentOS, Ubuntu, gOS etc). I have written on this subject on numerous times and also formed a few startups that focused on using and promoting this technology from the get go. So today, I announce the launch of a dedicated blog on this subject called, XenStreet.com. XenStreet will focus on not only Unix and Linux but also the OpenSource movement as well. We shall review the best of what is out there, the impact it is having in the world in general and developing economies like Pakistan in particular. So stay tuned to read and review the articles on XenStreet. And if you would like to contribute, get in touch with us we shall be happy to add you as a contributer on our roster. 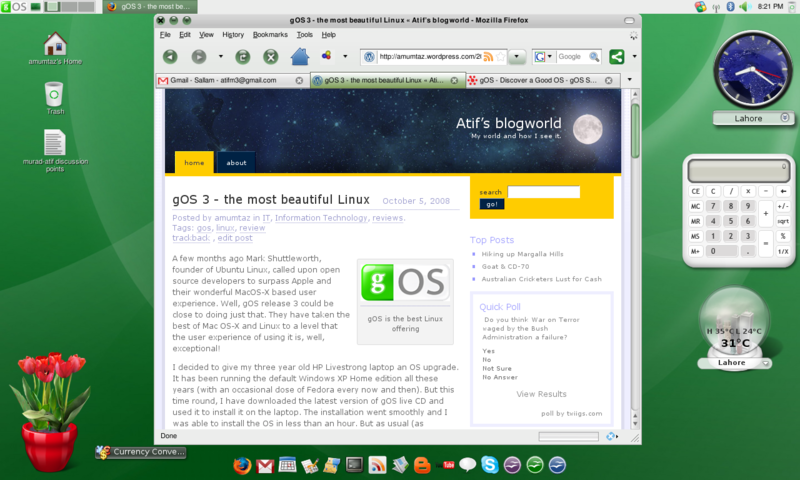 Check out our first article on XenStreet.com on gOS distribution of Linux.